As part of the 2013-14 brand campaign, we created a series of spots featuring some of USA TODAY'S writers and columnists. The idea was to highlight the unique perspective, or "voice," they each have to help illustrate the "smarter, faster, more colorful" approach of the news organization. Directed by Paul Riccio, Sandwick Films; Edited by Chuck Willis, The Cutting Room; Graphics by Michael Wiehart. The Bronx Zoo had no problem in terms of awareness, however they were struggling to drive attendance and stay relevant. We repositioned them as a place where people can go to “come back to wildlife,” and the results far surpassed our expectations. Not only was the work award-winning, but attendance and revenue numbers exceeded projections. The Original Moonshine was a great product with an excellent story and authentic background, but very little in the way of voice. 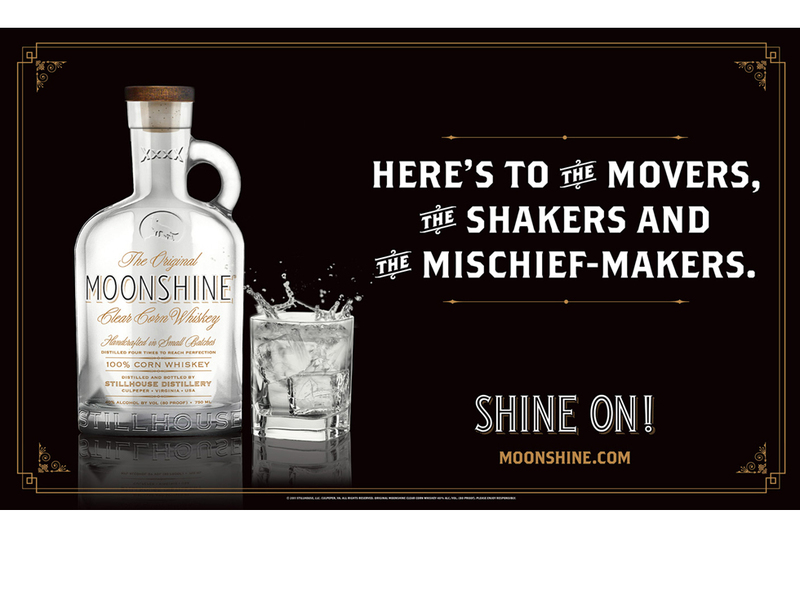 We harnessed the history, the attitude, and the irreverent spirit of Moonshine in order to establish a clear personality and then implemented it through video, social media, and traditional advertising. Lindblad National-Geographic Expeditions is a ship-based travel company that provides guests with immersive experiences in the world’s most inspiring geographies. 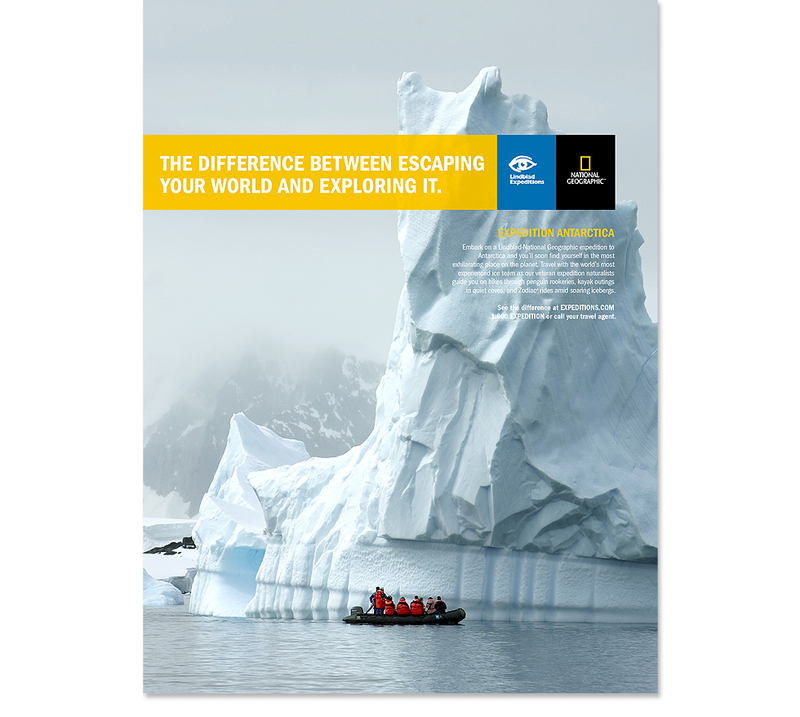 To help them distinguish themselves from your traditional “vacation getaway” we established this campaign, urging the target to consider the transformative experience that Lindblad Expedition offers. The budget for the Kehinde Wiley exhibition was small, so we decided to concentrate the resources we had into one big effort that would make a splash. We took advantage of the vibrant and cultural nature of the artist’s work and created a grandiose urban wall-scape, bringing the art to life outside the museum. Additionally, we filmed a video documentary, which generated buzz surrounding the show before, during, and long after its run. Flirt is a fun, inexpensive California red wine targeting women looking for an interesting, easy red wine choice. We designed the packaging, developed the brand story and created all of the advertising and marketing materials to convey a brand personality that was as unique and quirky as the wine itself. 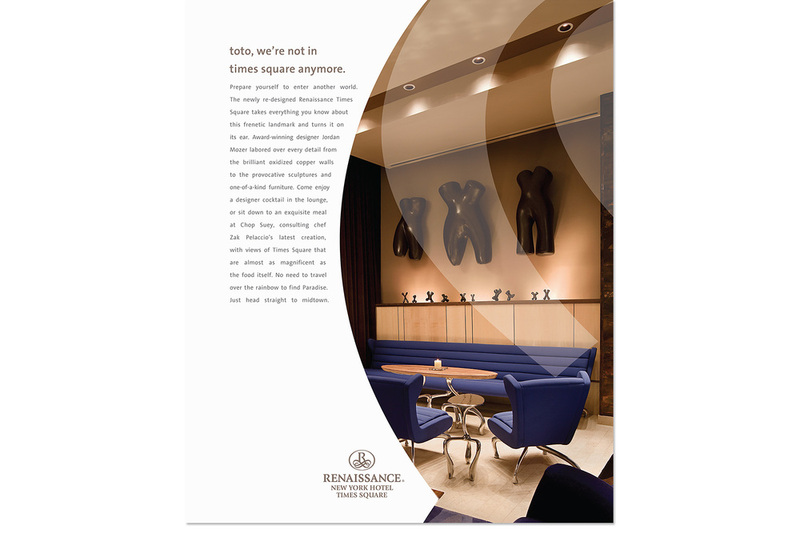 The Renaissance Hotel in Times Square was redesigned by award-winning designer Jordan Mozer, resulting in a jaw-dropping salute to “couture” architecture. The challenge we faced was to balance the magnificent and elaborate nature of the place itself with its infamous location amongst the crowds, noise, neon and all-round chaos of Times Square. We ended up using that remarkable contrast as the basis for our campaign. In addition to print and digital ads that ran nationally, the direct response portion of our campaign generated a whopping 6% response, and was awarded an internal Marriott award for Best Global Integrated Campaign. Not too shabby.